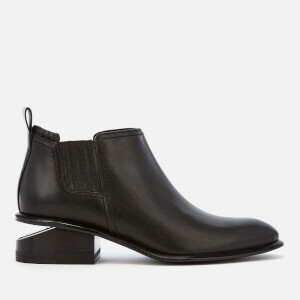 Women's black leather ankle boots from Alexander Wang. Crafted with sock-like leather uppers, the 'Kori' boots are constructed with an almond toe and top stitch detail. 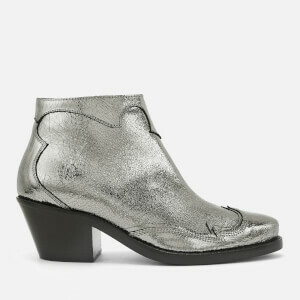 The sock boots are set upon a stacked, cut-out heel with a silver-tone metal plate and a small stacked leather heel. Complete with a pull loop to the top line for entry assistance and a branded dust bag.